The Helix Super Scotties are at it again with Super Scotties Sports. 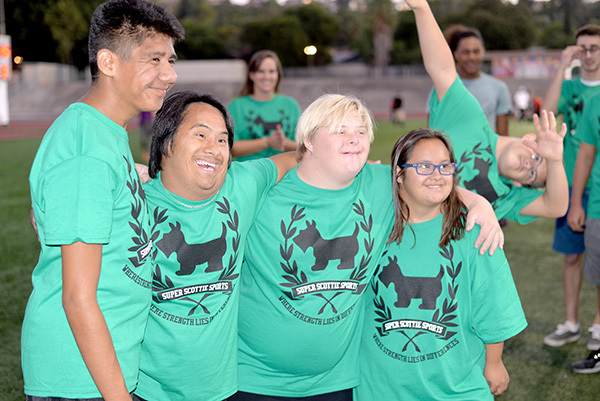 This inclusive sports program encourages students with severe disabilities (Super Scotties) to participate in extracurricular sports activities with their general education peers. Student leaders Gabe Baker, Gabby Maraziti, and Alex Berg came up with the idea for this program after peer tutoring for several years with the Super Scotties. Baker, Marazati, and Berg are the presidents of the Helix chapters of the National Honor Society and California Scholarship Federation. Members of these clubs, along with their club advisors, are volunteering at extracurricular activities with the Super Scotties in order to gain volunteer experience and have an opportunity to interact with students who have disabilities. The varsity captains of various sports have been instrumental in creating activities and providing the opportunity for the Super Scotties to play the different sports with members of the teams. This gives the Super Scotties a platform to learn different skills, meet peers that they would otherwise not have an opportunity to connect with, and feel more connected with their school community. The inaugural Super Scotties Sports event was football, and the Super Scotties students ran plays with some of Helix’s standout football players. The second event paired Super Scotties with members of the varsity cheerleading team at the first CIF playoff game. There will be more to come as the year progresses. Our fall sports and academic competition season is in the books, and it was a very successful one for many of our teams. The field hockey team was league champion, going undefeated with no goals scored against them all season. They advanced to the Division 2 CIF quarterfinals. The girls volleyball team won the Division 3 CIF championship, and continue play at the next level. The girls tennis team also won their division of CIF. The football team won the first game of their CIF playoff bid as the second seed in the Open Division and will continue to the semi-final game. The Helix Math Engineering Science Achievement (MESA) program had a successful October. Helix hosted the cardboard boat competition in the pool on Oct. 21. There were 10 middle school and high school teams in the competition. Helix took first place in both high school levels, 9-10 and 11-12. The Highlander Marching Band and Color Guard has made it into state championships! On Saturday, Nov. 18, they traveled to Warren High School in Downey to compete against the top bands in their division. At the time of this report, the results were pending. The annual HIMA Mattress Fundraiser will take place Dec. 2. They are trying to raise $5,000 to support the music program. If you are in need of a new mattress, please come check it out on the Helix campus. The event will run from 10 a.m.–5 p.m.
On Dec. 6 and 7, the entire Instrumental Music Department will be hosting the annual “Snow Jams” concert. The concert will feature the Concert Band, Wind Symphony, Orchestra, and Pipe Band. Tickets will be available soon on their website: helixinstrumental.org. On Dec. 5, at 2:30 p.m., the community is invited to the dedication and ribbon cutting for our new and upgraded facilities. Tours of the new Student Services building, the Sports Medicine and Technology facilities, and the weight room and team rooms will be available. Parking is available in the student parking lot, under the new solar carports. RSVP to Monica Osterloh at mosterloh@guhsd.net.